five + nine = Required Please enter the correct value. Intel Corp. (Nasdaq: INTC) reports Q3 2015 results after the close today, and the Intel dividend history has some investors hoping for a payout increase. The Intel dividend history began when it announced its first payout on Sept. 18, 1992. The first dividend was $0.10 a share paid on Dec. 1, 1992. Intel began its dividend as a statement of the confidence in its business and future. It was also viewed as a show of Intel's desire to be considered a more mature tech company. Younger companies in the sector typically use all of their cash to finance growth. Intel has paid a quarterly dividend for last 23 consecutive years. The Intel dividend history also shows the world's largest chipmaker has hiked payouts for the last five years. The latest increase came on Jan. 27, when Intel lifted its quarterly distribution 7% from $0.225 per share to $0.24. The current quarterly distribution of $0.24 a share gives Intel's stock a 2.98% yield. That's on par with tech peers Microsoft Corp. (Nasdaq: MSFT) and Cisco Systems Inc. (Nasdaq: CSCO). It also tops the S&P 500 Index's overall yield of 2.18%. 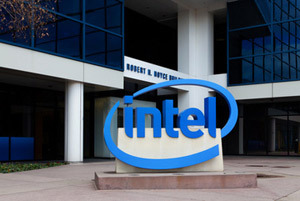 On June 1, Intel agreed to buy Altera Corp. (Nasdaq: ALTR) for $16.7 billion. It was a move aimed at defending its presence in data centers. Intel is paying $54 a share in cash through the deal. That's an 11% premium to Altera's closing price on the day prior to the deal's announcement and a 56% premium from March 26, the day before the possibility of a deal was first reported. The transaction is expected to close in early 2016 and add to Intel's earnings and free cash flow in the first year after the close. That suggests additional dividend hikes may be on the horizon in 2016. Right now, the focus is on Intel's Q3 earnings report scheduled for Tuesday after the close. Analysts estimate earnings per share (EPS) of $0.59 on revenue of $14.22 billion. That would be down 10.6% and 2.6%, respectively, year over year. In each of the last four quarters, Intel has bested or matched EPS consensus with an average beat of 6.3%. Intel shares have seen an average one-day gain of 1.5% following earnings results each of the last four quarters. Data center growth is the key topline driver for Intel, so investors will be listening for how the Altera acquisition is expected boost this unit. Additional interest will be on Intel's plans for expanding in the mobile and smart-car markets. At $32.29, Intel shares are down 11.02% year to date.